This cat (which graces the north-facing wall of The Garden) has been around as long as I can remember. 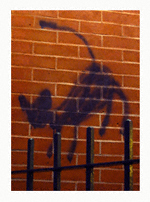 I have noticed all other graffiti that has found its way to this edifice has been removed— but not this kitty. I have long intended to get the story behind this fetching feline. Last night I finally did. Faced with the prospect of having to eat a jarring combination of (questionably edible) foodstuffs for dinner the Mister and I patronized The Garden. As luck would have it, I recognized one of the owners of this establishment. He was engaged in a conversation with another gentleman but having at long last the opportunity to shed light on this mystery I politely interrupted. Miss Heather: Pardon me for butting in but aren’t you the owner of this establishment? Owner: Yes, I am one of them. Miss Heather: What’s the deal with the cat on your building? The black cat. Approximately 8-9 years ago someone spray-painted this piece of graffiti onto The Garden. The owner liked it so much he didn’t see fit to remove it. five years ago he asked someone to cover it up with primer. When the person with the primer showed up this gentleman (who the owner of The Garden described as being a “cat person”) had changed his mind. He had grown attached to it. And so it has remained on Kent Street ever since. I have no idea what the person responsible for this was thinking when he (or she) created this cat. Was his intent vandalism or art? I don’t know and quite frankly I am comfortable with not knowing. It has since become a beloved member of the community and I suspect I speak for many when I say I hope he (or she) stays with us for a very, very long time! It’s a shame the Noble Street elephants had to go — as well as their owl friend who hung above the glass roof — so it’s nice to hear the Garden’s cat is here to stay. agree with Rutila. i liked that elephant. and i love the cat.